BACKGROUND AND PURPOSE: Intracranial lipomas are uncommon congenital malformations that most often are asymptomatic. A rare subset of intracranial lipomas arises within the vestibule of the inner ear, which can cause sensorineural hearing loss. We present the CT and MR imaging characteristics of lipomas within the vestibule of the inner ear and propose a pathogenetic mechanism for this malformation. METHODS: We retrospectively reviewed five cases of vestibular lipoma. T1-weighted axial conventional spin-echo and T2-weighted axial fast spin-echo sequences were performed in all five cases. Four patients underwent T1-weighted fat-saturated imaging, and one underwent CT scanning with Hounsfield units measured. RESULTS: Four female patients ranging in age from 10 to 40 years and one 26-year-old male patient had sensorineural hearing loss. Two patients had progressive high-frequency loss; one, sudden-onset high-frequency loss; and two, congenital high-frequency loss. All had lesions within the vestibule that displayed hyperintensity on T1-weighted images, isointensity to slight hypointensity on T2-weighted fast spin-echo images, hypointensity with fat saturation, and fat attenuation on CT scans. Three of the cases were associated with lipoma of the cerebellopontine angle. In none of these cases were the cerebellopontine angle and labyrinthine lipomas contiguous. CONCLUSION: Intravestibular lipoma is considered when a focal hyperintense lesion is identified within the vestibule of the inner ear on T1-weighted MR images. Lesion hypointensity on fat-saturated T1-weighted MR images verifies its lipomatous nature and separates it from intralabyrinthine hemorrhage or highly proteinaceous fluid. Current theory explaining the pathogenesis of intracranial lipomas involves persistence and maldifferentiation of the primitive meninx primitiva. Persistent meninx primitiva may occur in the vestibule by direct incorporation into the otocyst as it invaginates at 4 to 5 weeks’ gestation to form the membranous labyrinth. A single case report of an intravestibular lipoma exists in the literature (1). Because it represents a rare lesion with associated sensorineural hearing loss, it is important to further explore the relationship of this entity to this symptom. Imaging features, pathophysiology, and a possible pathogenetic mechanism are presented and discussed. A retrospective study at five institutions reviewing five patients with either CT or MR imaging evidence of intravestibular lipoma was completed. The clinical and radiologic records were reviewed in all five cases. All patients were examined with conventional T1-weighted spin-echo and T2-weighted fast spin-echo MR imaging. In addition, four patients underwent contrast-enhanced fat-saturated T1-weighted imaging, and one patient underwent CT with Hounsfield units measured. MR images with and those without fat saturation were reviewed for lesion signal intensity characteristics on T1-weighted and T2-weighted fast spin-echo images. Contrast-enhanced T1-weighted images were evaluated for the lack or presence of enhancement. CT scans were analyzed for lesion attenuation and Hounsfield unit measurements. Associated cerebellopontine angle lesions were noted when present. All five patients had sensorineural hearing loss, which corresponded to the side of the lesion seen on the MR images. In four of these patients, the hearing loss was long-standing, and in two, it was congenital. Only one patient experienced progressive hearing loss, and in one, the loss was classified as profound. All five patients were free of vestibular symptoms. Each patient had a mass in the vestibule; three, on the right; and two, on the left (Table). 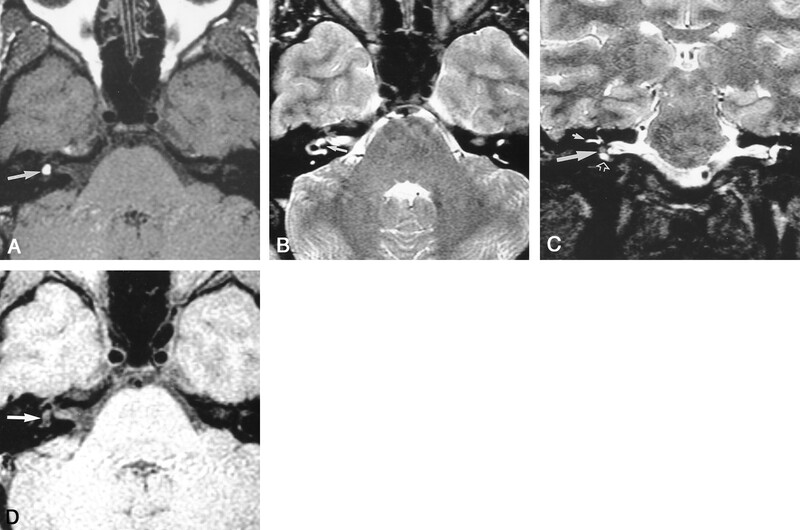 Three patients each had a second mass in the cerebellopontine angle, which showed identical imaging characteristics. All vestibular and cerebellopontine angle masses displayed increased signal intensity on T1-weighted images (Figs 1–4). T2-weighted fast spin-echo images displayed iso- to hypointense signal relative to cerebral cortex (Figs 1 and 2). Fat-saturated T1-weighted images revealed complete saturation of the hyperintensity in all four cases in which it was used (Figs 2–4). No enhancement within the lesion was identified on any of the contrast-enhanced images. The single case in which CT scanning was performed revealed hypoattenuated masses in the vestibule and cerebellopontine angle. Hounsfield attenuation units were consistent with fat, measuring −112 for the vestibular mass and −142 for the cerebellopontine angle mass (Fig 1). A, T1-weighted axial image (400/15/2 [TR/TE/NEX]), obtained through the left internal auditory canal, shows a hyperintense mass in the cerebellopontine angle (thick black arrow) and vestibule (white arrow). The seventh (open arrow) and eighth (small black arrow) cranial nerves can be seen coursing through the cerebellopontine angle component. B, T2-weighted fast spin-echo axial image (4000/90/4), obtained through the left internal auditory canal, clearly shows the intravestibular location of the mass (arrow). C, Axial CT scan, obtained through the left internal auditory canal, shows the hypoattenuated cerebellopontine angle and vestibular masses. Hounsfield attenuation units are −112 for the vestibular component (1) and −142 for the cerebellopontine angle component (2), consistent with fat attenuation (lipoma). A, Axial T1-weighted image (400/14/2) shows a hyperintense mass in the right vestibule (arrow). B, Axial T2-weighted fast spin-echo image (4000/102/4) shows the intravestibular mass to be hypointense relative to the fluid-filled membranous labyrinth (arrow). C, Coronal T2-weighted fast spin-echo image (4000/102/4) shows the intravestibular mass (large arrow), the horizontal semicircular canal (small arrow), and the basal turn of the cochlea (open arrow). D, Axial T1-weighted image (500/20/4) with fat saturation reveals saturation of the intravestibular mass (arrow), consistent with a lipoma. A, Axial T1-weighted image (533/12/4) shows a hyperintense left cerebellopontine angle (curved white arrow) and an intravestibular (straight white arrow) mass. The eighth cranial nerve can be seen coursing through the posterior portion of the cerebellopontine angle component (black arrow). B, Axial T1-weighted image (533/12/4) with fat saturation displays saturation of the cerebellopontine angle (black arrow) and vestibular (white arrow) lipomas. A, Axial T1-weighted image (400/14/2) reveals a hyperintense mass in the right vestibule (arrow). B, Right vestibular mass saturates on this T1-weighted axial fat-saturated image (500/20/4) (arrow), confirming a lipoma. Intravestibular lipoma is a rare congenital lesion that is often associated with lipoma in the cerebellopontine angle. These lesions can result in unilateral sensorineural hearing loss and will therefore be discovered while searching for the more common acoustic schwannoma. Knowledge of the MR imaging characteristics of intravestibular lipoma permits correct diagnosis. Because surgical intervention in patients with intravestibular lipoma should be avoided, correct diagnosis is essential. All five patients in our series displayed unilateral sensorineural hearing loss, which correlated to the side of the lipoma. The hearing loss was classified as congenital in two cases, long-standing in two, and new onset in one. The lateralization of the hearing loss to the side of the lipoma in all cases would suggest an association. This association is in contrast to other sites of intracranial lipomas, which, in general, are asymptomatic. The mechanism for hearing loss could be mass effect from the lipoma or a result of chemical toxicity to the cochlea. If the intravestibular lipoma were dampening stapes footplate pulsation, a conductive hearing loss would be expected. This was not the case in our series in that all patients suffered sensorineural hearing loss. In patients with both intravestibular and cerebellopontine angle lesions, the hearing loss could be due to mass effect on cranial nerve VIII from the cerebellopontine angle lipoma through which the eighth nerve passes. However, this would not explain the hearing loss in patients with isolated intravestibular lipoma. A toxic cause for the hearing loss could be theorized if the lipoma were located within the membranous labyrinth. Lipid material or breakdown products could be transported via the membranous labyrinth to the cochlea and exhibit a toxic effect on the cochlear hair cells. This could also explain the high-frequency nature of the loss in that the hair cells along the basal turn would be most affected because of reflux of the toxic material through the ductus reuniens. Lipoma location within the membranous labyrinth seems to be supported by the only surgically proved reported case of an intravestibular lipoma. In this single pathologically proved case, the lipoma in a 35-year-old woman was surrounded by vestibular epithelium, consistent with an intramembranous location (1). This patient had clinical symptoms of vertigo, daily nausea and vomiting, tinnitus, and ear fullness. In addition, complete hearing loss was displayed in the affected ear. This constellation of findings clinically suggests endolymphatic hydrops, which may have been due to mass effect from the lipoma or to an unrelated history of mumps labyrinthitis in this patient. None of our five patients displayed vestibular or hydropic symptoms, and all retained some hearing in the affected ear. It is possible that the patient whose case was presented in the literature could have been displaying an end-stage picture of this disease process during which endolymphatic hydrops occurs after hearing loss. However, considering the lack of vestibular symptoms in all of our patients, the hydrops in the patient whose case is presented in the literature may have been unrelated. Long-term clinical follow-up of our five patients will help to sort this out. The congenital or long-standing nature of the hearing loss in four of the five patients would be consistent with the congenital character of the lipoma. The imaging diagnosis of intravestibular lipoma consists of a nonenhancing intravestibular lesion that is hyperintense on T1-weighted images and suppresses completely with fat saturation. Alternatively, Hounsfield attenuation units consistent with fat are also diagnostic. The signal intensity on T2-weighted images was variable but ranged from iso- to hypointense on T2-weighted fast spin-echo images. Additional sources for hyperintensity within the vestibule on T1-weighted images include hemorrhage or highly proteinaceous fluid. These are easily differentiated from a lipoma because of their lack of signal intensity suppression with fat saturation. Because of the simultaneous occurrence of a cerebellopontine angle lipoma in three of our cases, we postulate that the mechanism of formation of intravestibular lipomas is similar or identical to cerebellopontine angle lipomas. Current theory explaining the pathogenesis of intracranial lipomas involves persistence and maldifferentiation of the primitive meninx primitiva, the loose embryonic mesenchymal precursor of the subarachnoid space and meninges (2). We think that the embryology of the developing ear provides clues to a possible pathogenetic mechanism of the intravestibular lipoma through either direct incorporation or neural transport of meninx primitiva into the developing inner ear. In the 4-week embryo (Fig 5), the auditory placode invaginates inward to form the auditory (otic) pit, which becomes surrounded by mesenchyme. At the end of the 4th week, the pit closes to form the auditory vesicle (otocyst), which separates from the overlying ectoderm and migrates inward. The surrounding mesenchyme is the future otic capsule (bony labyrinth). In the 5- to 6-week embryo (Fig 6), the otocyst elongates and three deepening folds develop. These infoldings begin to demarcate the endolymphatic duct and sac, the saccule and cochlear duct, and the utricle with its three semicircular ducts (3–6). Cavitation of the meninx primitiva is occurring simultaneously with the formation of the inner ear in the 4- to 6-week embryo (7). Direct incorporation of meninx primitiva, or its mesenchymal precursor, into the developing otocyst as it invaginates or folds could explain an intralabyrinthine location. Using this theory, one might also expect to find lipomas within other portions of the labyrinth, such as the cochlea or semicircular canals. We have not yet seen such a case. Neural transport of meninx primitiva along the developing acoustic nerve could also explain an intralabyrinthine location. The acoustic nerve is near full maturity by the end of 8 weeks. Central connections to the brain stem are established initially by the vestibular nerve and then later by the cochlear nerve. Migration of glial cells from the brain tube, which will envelop the acoustic nerve, begins once the central connections have been made. These glial cells proceed from central to peripheral. Because central connections of the vestibular nerve occur before central connections of the cochlear nerve, glial migration also occurs earlier on the vestibular nerve. Neural transport of meninx primitiva into the labyrinth may occur along the developing cranial nerve VIII itself or perhaps be carried along by the enveloping glial cells as they migrate from central to peripheral. This process occurs earlier along the vestibular portion of the nerve, which could explain the propensity for vestibular involvement. This theory offers a plausible explanation for internal auditory canal lipomas, and the same mechanism has been suggested to explain a lipoma associated with cranial nerve V, extending through Meckel’s cave to the foramen ovale (8). We present the CT and MR imaging findings in five patients with lipoma within the vestibule of the inner ear. The association of three of these cases with a separate cerebellopontine angle lipoma suggests a similar and likely related pathogenesis. Sensorineural hearing loss occurred in the corresponding ear in all five patients and may have been caused by a toxic effect on cochlear hair cells or to mass effect on the membranous labyrinth.